Angelfire is a micro-glitter featuring various holographic and metallic microglitters in a red-violet base with intense blue shimmer. Shown is 2 coats with top coat. Candy Necklace contains pastel, orange and almost-neon red dots in a clear multi-shimmered base. All nails are 1 coat over 2 coats of Nicole by OPI Promises in the Dark. Dolce Lussuosso Lustrini (Sweet Glitter Luxury) is a complex blend of gold, copper, bronze, brown and caramel glitters with jewel-toned jelly, metallic and holographic accents in a clear gold-shimmered base with microglitter overlay. Here is 1 coat over 3 coats of Nicole by OPI Better After Dark. Flowers for Destiney was created in memory of a girl named Destiney to benefit the National Urea Cycle Disorders Foundation (NUCD). Destiney loved yellow and flowers. The lacquer dedicated to her is made with assorted yellow glitters, yellow, coral and white flowers with an orange holographic micro-glitter overlay in a translucent subtle multi-shimmered yellow base. These photos show 1 coat over 3 coats of See Change. Jammy is made with red-violet holographic microglitter and is accented with holographic red, blue-violet, magenta and purple glitters, as well as metallic magenta dots in a subtle clear magenta base. All nails are 2 coats with top coat. Lettuce Be Young at Heart is made with neon green and holographic microglitter accented with holographic green triangles and neon green diamonds in an intense chartreuse-shimmered translucent base. Here is 3 coats with top coat. 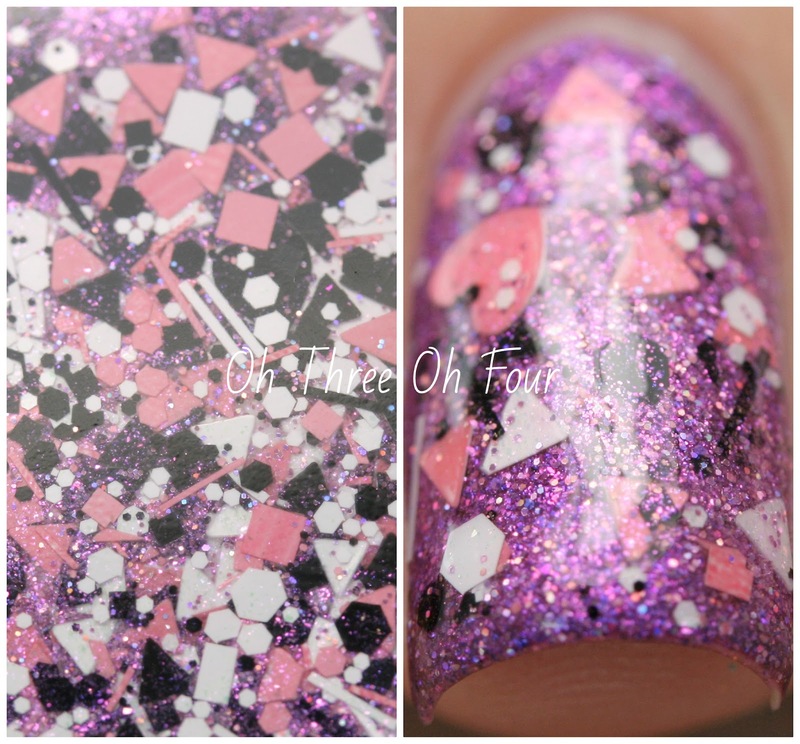 Love Triangle is made with black, white and pink hearts and triangles as well as other shapes in a clear pink-shimmered base with a pinch of pink holographic micro-glitter. I used 1 coat over 2 coats of Angelfire for these photos. Miss Rose Gold is a blend of pink and gold holographic microglitters with matching accents and a pink-shimmered base. Shown is 3 coats with top coat. Paleo Muffin is a blend of cool gold and silver holographic micro-glitters studded with assorted jewel-toned accents in a warm pink-shimmered clear base. All nails are 3 coats with top coat. See Change. contains aqua holographic microglitter accented with gold and aqua holographic glitters. Subtle gold-to-green shifting shimmer and clear base. I used 3 coats with top coat for these photos. 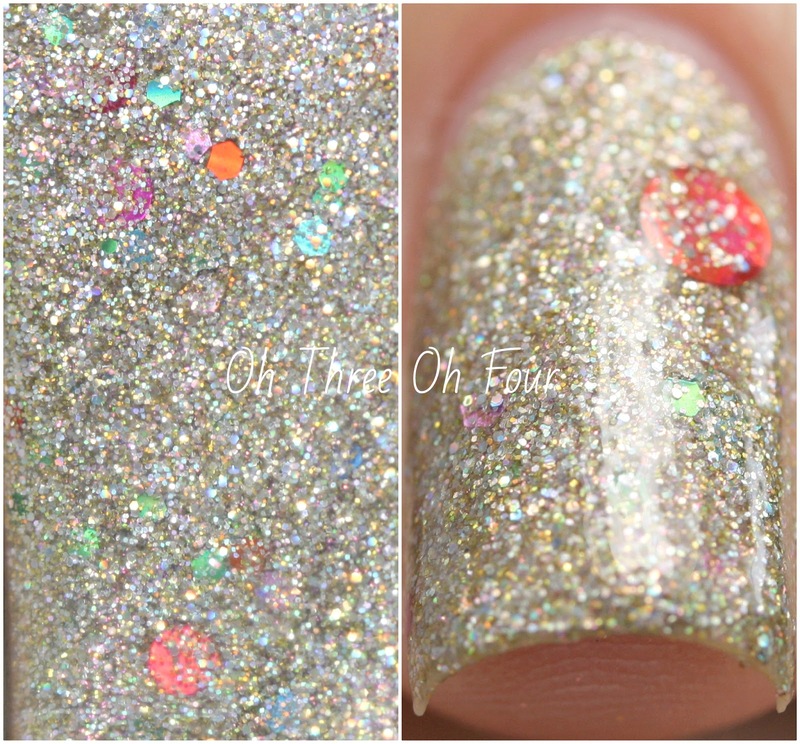 The Golden Hour is a mustard-yellow shimmer with gold holographic micro-glitter. All nails are 2 coats with top coat. Tilly, the Lizard Queen is made with black holographic microglitter and deep teal holographic glitter accented with red, green and cyan glitters with a bright aqua shimmer in a clear base. Here is 3 coats with top coat.